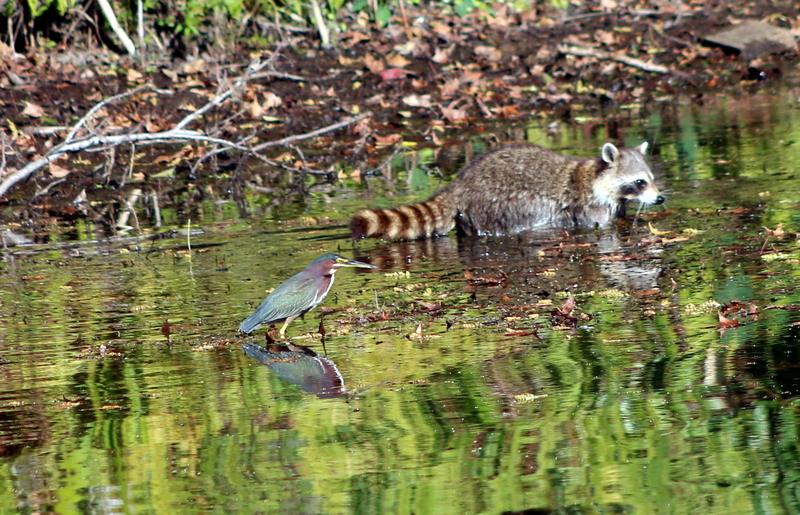 Recently, I noticed a raccoon wading in the water at our home on Lake Ola in Tangerine, Florida. I grabbed my camera and as I focused in on him, I noticed there was a green heron right next to him. Each of them went about their business in close proximity and seemed to not be bothered by the other’s presence. Everybody knows that one of the first rules of keeping peace in the family is to not discuss politics and religion at the dinner table. If only two people at the table enjoy a good debate, then everyone else becomes uncomfortable. If only one person is a good debater, then the other will not enjoy the joust. Once a normal person is outflanked by someone who has prepared better or simply understands the topic more thoroughly, the other person has nowhere to go but to dip into his/her emotions. Once you begin to defend your point of view with your emotions, it becomes personal and the wonderful meal that was prepared for you loses it savor. The best debates, the ones that benefit everyone in the room, are done by people who respect each other and genuinely desire the best for the other side even though they may be as different as a raccoon and a bird. That respect can be built around a dinner table where interests are shared and people begin to know each other better. Each of us has his own story of struggle…of failure and success…of quitting and persevering…of pain and joy…and we see everyone’s life through the lens of our own lives. Once we understand the life of everyone around the table more, we build respect and a desire for their well being. We also begin to feel that those around the table feel the same way about us. In this environment, you can allow yourself to be vulnerable because you know that the other side wants the best for you. Once those at the table become vulnerable, your discussion about God or politics or any other controversial issue, can be done without any endgame in mind other than the desire to be unified, not in your opinions of the affairs of the world but in your respect for and understanding of each other…and that is the basis for peaceful progress. So, add an extra chair and welcome those you love and don’t yet love to dinner. If you do it right, you may actually enjoy the meal! The more that we eat and drink at the same dinner table, the better off our families and our world will be…if we follow the golden rule to genuinely attempt to love and respect our neighbors as ourselves.